Is Daphne Right for my Garden? There are about 70 species of Daphne although only a few of them are commonly grown in the UK. They can broadly be split into two types; those which are classified as alpines and the larger more tolerant garden shrubs which are dealt with in the article. In the UK the commonly grown shrubby forms are either evergreen or semi-evergreen and have decidedly scented flowers. Good quality and healthy Daphne shrubs are more expensive than the average shrub because propagation from seed is erratic and taking cuttings has a higher than normal rate failure with some species almost always failing. Often, they are propagated by grafting, typically onto Daphne tangutica which grows easily from seed. Once established, most Daphne shrubs grow away fine. They grow best in part shade to full sun. Moisture at the roots is key to successful growth. The soil must be free draining but receive a good supply of water. Daphne will not tolerate water-logged soil. Most of the common Daphne shrubs sold in the UK are either evergreen or part evergreen but don't expect much from them in winter months. 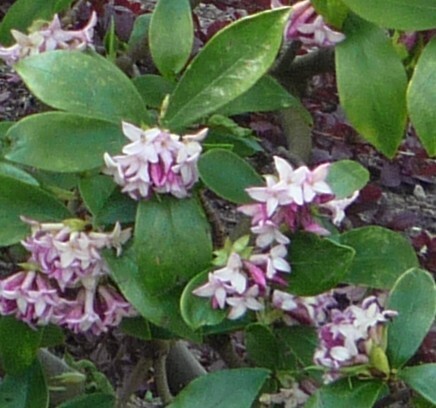 A neutral soil (neither alkaline or acidic) will suit all Daphne shrubs. Their root structure, although extensive is easily damaged so they do not transplant well at all. Get the position and available space for this shrub correct when you plant it and leave it there. All are hardy down to -5°C, many down to -10°C, see the section on varieties below for more specific information. Daphne bholua is probably the least cold tolerant with -5°C being tolerated only for short periods of time. They have a life span of about 15 years, some times up to 20 years depending on conditions. They do not require pruning, a clear up of fallen leaves is all that is required. They should not be pruned to shape, this simply encourages tender new growth which is then damaged by the cold. Daphne can be planted all year long if the soil is not frozen and you can water well when conditions are dry. 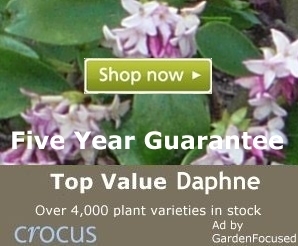 Mid March to April and mid September to October are the best times to plant Daphne shrubs. Choose a partial shade to full sun position. They will grow in full shade but the flowering will be greatly reduced and they will also become straggly. Daphne have scented flowers and it is often a good idea to plant them where you appreciate that, by paths or at the front of a bed is best. If the soil is heavy or is not free draining add lots of well rotted compost to the area and dig it in well. Some horticultural sand add to the mix is also beneficial. Place the plant into the hole. If your daphne is grafted (and they commonly are) plant it so that the graft is 3cm to 5cm below the soil surface. If it has not been grafted, plant it to the same depth as it was in the pot. Fill around the root ball and firm the soil down gently but firmly. Water well to settle the surrounding ground around the root ball. Plant to the same depth as your shrub was in the pot. Often they are grated and the join should be a couple of centimetres below the soil level. The primary care need for Daphne is to ensure that they have the correct amount of moisture at the roots. They will require watering in dry conditions but should never be water-logged. Too much water causes fungal diseases. If you remember, a handful or two twice a year of blood fish and bone will feed them all they need. Do not add any quick release nitrogen rich fertilisers. They should not be pruned, a simple clear up of dead leaves and debris around the plant will do them fine. An annual layer of well rotted mulch around the plants in June time will conserve moisture and over time will help to keep the texture of the soil open and free draining. Daphne require no pruning and do not respond well to being pruned. Ensure they have sufficient space to grow to full size when they are planted. Daphne are only suited for growing in deep containers because they need room for their roots to spread. We would advise only planting them in the open ground. We would suggest a Philadelphus / Mock Orange or Choisya as excellent alternatives for container growing. Good flowering potential and they can easily be kept to the size of the container. Daphne are unlikely to suffer and problem with pests however, if you notice an aphid attack then it is best to treat it as soon as possible. The reason is that they can quickly encourage and spread fungal diseases. The main disease of Daphne are fungal infections and general ill health causing browning or yellowing of leaves. These are almost always caused by environmental factors, the key on being too much or too little watering. Get the moisture correct at the roots and your Daphne should be problem free. They are also susceptible to Honey Fungus but this is not specific to Daphne, so are many shrubs. If they are affected by this fungus it's best to remove the shrub and plant something which can resist it. See also the comment at the end of end of Daphne Question and Answer page dated 2nd January 2018. This is one of the most frequently planted varieties because it has a delicious scent. They have a height and spread of 1.5m / 5ft at maturity. The flowers are a delightful pink / white mix, produced in January to March. This is one of the more robust of the Daphne species and grows well in full sun or part shade. Avoid planting this species if you soil is alkaline. It forms a neat, dense, rounded shape and requires very little care. It is hardy down to -10° / 14°F and is evergreen. A particularly good variety is Daphne odora Aureomarginata which has glossy green leaves with golden edges. This first gained an Award of Garden Merit in 2002 which was reconfirmed in the RHS 2013 trials. Not so widely available as some other Daphnes but well worth seeking out because it flowers for longer than other species. The reason is that most Daphnes flower on stems produced the previous year but "transatlantica" flowers primarily on new wood. There is a primary flush of flowers in April to May followed by more flowers through to September. The flowers have the same heady scent as "odora" above with lighter pink and white, trumpet shaped flowers. These are easy care shrubs and fully hardy to -15° / 5°F. The lance shaped leaves are dark green and glossy and are there for 10 months of the year. They are "semi-evergreen" rather than fully evergreen and will loose many of their leaves in winter though not all. 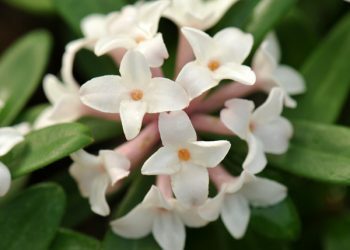 The RHS only got round to trialing this species in 2012 and have already given Daphne translatlantica (Eternal Fragrance) Blafra an Award of Garden Merit. Other varieties of transatlantica are equally as good. This variety is available to buy online from the GardenFocused recommended suppliers by clicking here. We thoroughly recommend it. Burkwoodii (a hybrid) has deeper coloured flowers than the two varieties above, typically light purple. The same delicious scent is present and in good years the main flush of flowers in May is often followed by more flowers in September. It also grows to around 1.5m / 5ft high but is very upright with a spread of only 1m / 3ft so is ideal for gardens where space is at a premium. Hardy down to -15° / 5°F, get the moisture levels correct at the roots and this is an easy care shrub. It does naturally drop some leaves in summer time but these soon grow back. The variety Daphne burkwoodii Somerset is an excellent choice. This shrub is available to buy online from the GardenFocused recommended suppliers by clicking here. A delightful low maintenance evergreen shrub which forms a dense cushion about 40cm / 16in high and 90cm / 3ft wide. Lavender-pink, highly scented flowers appear in early April (the picture below was taken in mid-April) and last through to May. The leaves are an attractive deep, glossy green. It is ideal as a rockery plant or the front of a border which is very well-drained. In this type of position it is almost maintenance free. It is frost hardy down to -10C / 14F. It does best in full sun and prefers a neutral soil. This is a slow growing shrub and will take 10 years or more to reach full size. Daphne can be propagated from seed, cuttings or grafting. They are more difficult compared to most other shrubs and some simply don't grow from seed or cuttings. Even grafting is a slightly complicated process and for that reason we refer you to this article here about the grafting process. Below we list the key strengths and weaknesses of Daphne.